This breezy little grass showed up in my parking strip a couple of years ago. I don’t know where it came from, since I haven’t seen it in any neighbor’s gardens. 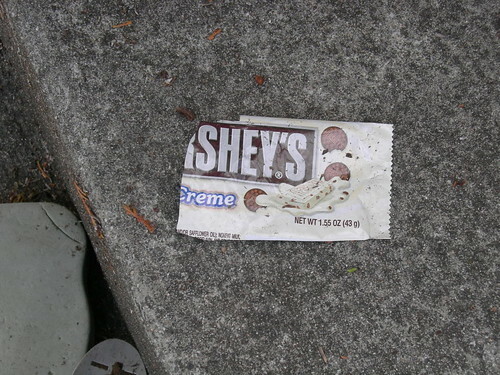 It’s in a silly spot, right at the edge of the sidewalk, but at least it flops over the other direction. I should probably move it, but first I’d like to know if it’s something I should keep around. I love the way grasses look, but I’m allergic to them so have not really welcomed too many into my garden. Any guesses on what it might be? Looks kind of like some stipas I’ve seen, but I’m certainly no expert. One possible clue – it’s having babies! Hm, maybe that means it’s likely to want to take over. I didn’t notice these sprouts in previous years – maybe the hard winter did something to put the plant into a frenzy of spring replication?? It’s funny how the definition of a weed is just a plant in a place we don’t want it. Since I tend to be a cheap and disorganized type of gardener, I usually welcome self-sowers with open arms. But I don’t want to let a real thug get established! I’ll be curious to see if anyone has an ID.Thanks! I finally decided that today was the day to dig up my overgrown orange crocosmia and see if I could figure out how to divide it. I inherited it from a previous gardener but hadn’t touched it in the 3+ years we’ve been here, so it was pretty much now or never since it had basically stopped blooming. 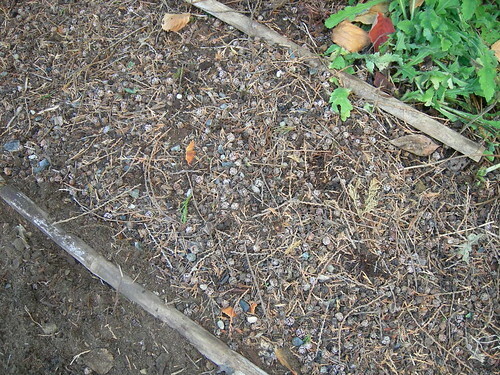 Northwest gardening expert Ciscoe Morris recommends digging up the entire clump, hacking off sections from the side, and discarding the middle (why? not mentioned in his article). So, that’s what I did. I had to remove a lot of quack grass roots, I hope I got it all (ha ha, I don’t think that’s ever possible, is it?) 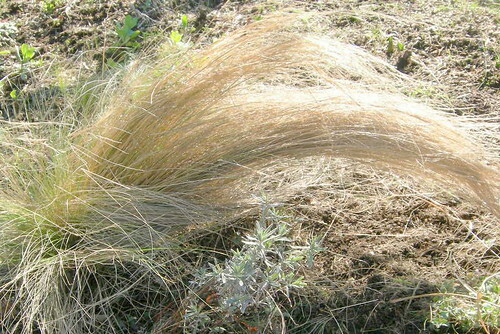 – this is the “before” pic, the white roots are the evil weed grass. I ended up with about 8 small clumps, most of which will go down in the parking strip (where I toss all my free/self-seeding/divided plants). 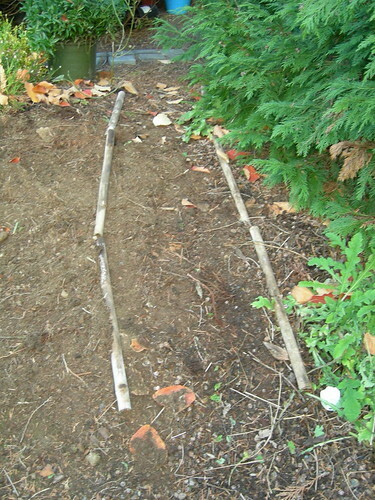 and then filled it in with cedar debris from the massive tree that adjoins the path. I didn’t level it very well and the cedar berries are a little unstable. Hm, I hope he doesn’t fall and sue me! I’ll have to work on it a bit more to make it better. 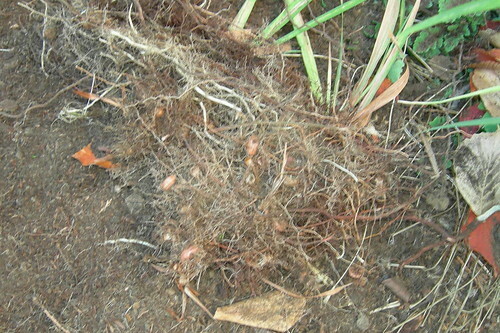 I put back one clump of crocosmia in the original spot and will hope for the best next summer. Then I remembered the two sad little native huckleberry plants I’d bought at a long-ago plant sale – they’d been languishing in a flat along with a still-unplanted hydrangea and a yellow cotinus I’m still deciding if I have decent spots for. I know huckleberries need rich forest-type soil and a lot of moisture to be happy, but that’s never going to happen here. 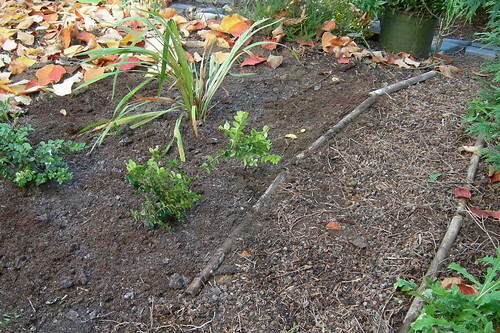 So, in they went and I added a lot of compost and mulched (when do I ever mulch?! That bag was probably three years old and had some weird whitish cast to the soil, which I hope was not plant-killing mold of some sort!). The bed needs more residents but I’m done for the day. 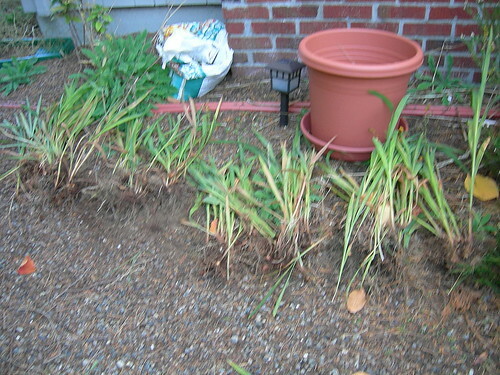 Now I just have to put in the rest of the crocosmia or give a few clumps away to neighbors. Then again, they probably don’t need the quack grass! 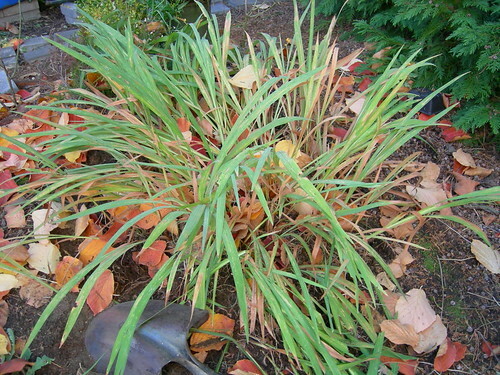 What do you do when you divide plants – replant elsewhere in your garden, give away, or toss the rejects? Or a bit of all three? I hadn’t been out to check on the parking strip garden in a while, beyond just glancing at it on my way elsewhere, so I hauled out my trusty pickle bucket, pruners and trowel to see what was growing there without my permission. It wasn’t too bad, so I’ll spare you individual photos of each culprit. 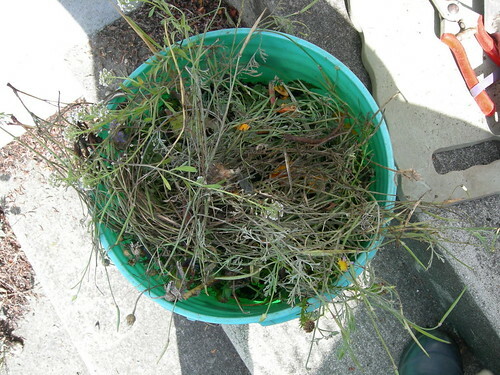 It took me a while to fill up the bucket with an assortment of unwanted or unsightly invaders – quack grass, spent California poppies, St. John’s wort seedlings (three full years after eradication and they’re still coming back – I’ve heard it can take five or longer, and that it can regenerate from any part of the plant!?! 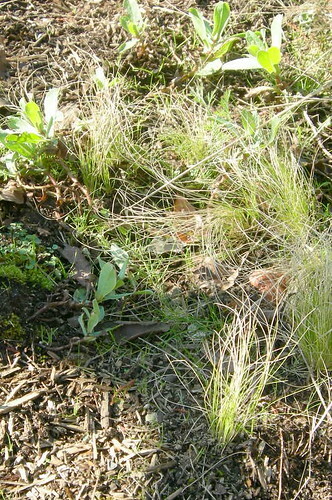 ), various dandelion relatives. Now that the rains are setting in, I’m sure they’ll start to really get going. I figure every weed I pull now is exponentially fewer that I have to nab next spring. Then again, it may be false economy, especially in places that don’t have something else going in to keep the weeds from just coming back again in the same place. At least I find weeding to be therapeutic, in small doses anyway. All better now. Well, I left more poppies and bachelor’s buttons than I probably should have, but what can I say, I’m weak where their cheery recurrence is concerned. Plan for tomorrow: buy mulch so I don’t have to do this so often! 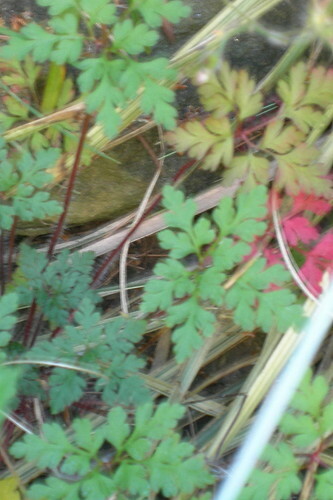 In a previous post about weeds, I mentioned one called Herb Robert, or Geranium robertianum. I feel a little sorry for whichever Robert it’s named for, since the other common name is Stinky Bob. 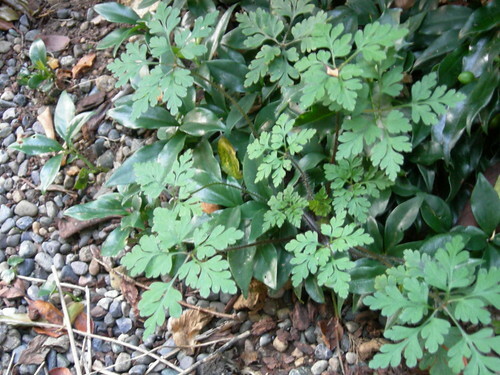 It’s a cute little member of the geranium family which escaped from gardens and has taken over a lot of space, at least in my area (Pacific Northwest). A few at a time are easy to pull up, but if they take over a large area, they choke out the native plants and it’s hard to get rid of. Plus, the smell is really unpleasant; I’m not sure what to compare it to – that rotting container of leftovers that got lost at the back of the fridge for too long, maybe? It’s not really like anything else I’ve ever smelled, for which I suppose I should be thankful. The odor stays on your hands after you touch the plant too, so it should be handled with gloves. Here’s a photo of one in my garden, just before I ripped it out. It looks kind of nice at the edge of the path with the sarcococca, too bad it’s a weed. It likes to hide in spaces that are hard for me to get to, like the top of the rock wall in back of the papyrus blades that always cut me up if I forget to wear long sleeves around them. This one is turning pretty fall colors and has probably already distributed a ton of seeds for next spring. It hasn’t made it down to my parking strip yet, maybe it likes the part shade of the upper garden better. In any case, don’t let its adorable little pink flowers (not visible in my photos), delicate foliage or funny, furry reddish stems fool you into thinking it’s a nice groundcover. Yank it out before it takes over the universe! Practicing organic gardening is rewarding in so many ways. 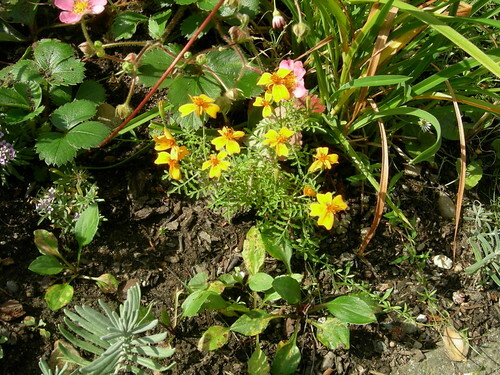 One kind of onerous task that can be therapeutic is the act of hand-weeding. I know some folks go for the corn gluten (does it really work? I’ve heard mixed things) or the pyromaniac’s dream tool, the propane torch weed killer. 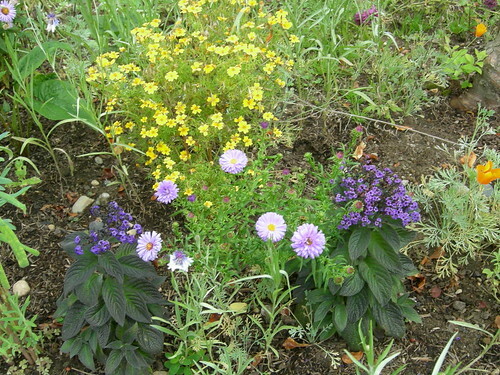 The best thing for my parking strip would probably be more perennial plants and ground covers, in order to provide less space for the weeds, and I hope to get more in every year. But in the meantime, I just have to count on my trusty trowel and do the best I can. Here are some of the fun varieties I contend with on a regular basis: quack grass, herb-Robert, bindweed (especially evil and hard to eradicate), Japanese clover, sorrel, and a bunch of dandelion-like weeds, not to mention the evil St. Johns Wort I yanked out of the parking strip three years ago that keeps trying to come back, the various lawns the previous owner took out even longer ago that want very badly to return, and all the other pesky ones I don’t know the names of. Phew, that was a very long sentence. I know California poppy is considered by some to be a weed, but it’s a nice place-holder in the parking strip until the later-spring plants fill in. The New York Times magazine had this interesting (and frightening) article about how global warming makes weeds stronger. They will probably be the last things standing, along with the cockroaches. The State of Washington has a web site devoted to its “noxious weed” list, with photos of nearly all the nasty varmints. 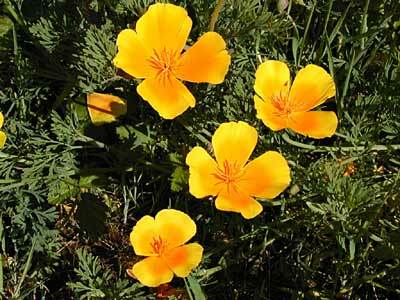 Some look quite pretty, but are invasive and crowd out native and threatened plant varieties. If you live in the Western US or Canada, this book is pretty amazing, even at $30. Maybe your local library can get it for you as an inter-library loan, if you don’t want to spend that much. What are your weed nemeses? How do you control them, especially organically?